Outside of Cambridge, the body of a young woman is found in the sluice gates after the spring thaw. There is little left to go on besides the clothes she is wearing and some hairs found stuck to them; her body is so badly decomposed there is no hope of DNA, nor are there any hairs even left on her head. This does not allow much in the ways of leads for detectives Chloe Frohmann and Morris Keene, but they are determined that they will solve this case. At the very least they must identify the victim and notify her family so they are not always wondering. At the same time, Mathilde Oliver is scouring Cambridge for a girl named Katja. Mathilde works in Cambridge’s post office and is one of the people tasked with following up on incomplete addresses. Katja has been receiving increasingly desperate letters from a young man named Stephen, addressed with only her first name and the college, but there doesn’t seem to be anyone by the name of Katja at Cambridge, at least not anyone who matches the description in the letters. Before long, it begins to seem that there is some connection between the mysterious Katja and the unidentified – and certainly murdered – body. To discover the true story, however, Frohmann and Keene must sort through secrets, mistaken identities, and their own personal weaknesses. 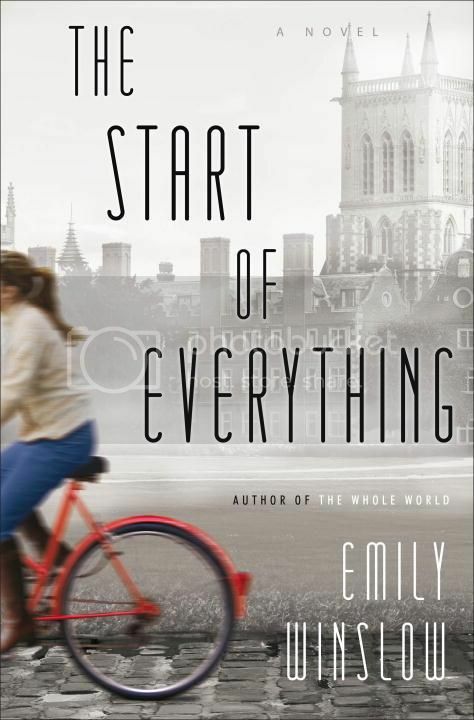 Like Winslow’s The Whole World, The Start of Everything would likely best be described as a literary mystery. Although there are detectives and a heinous crime that must be solved, the reader’s focus falls primarily on the individual characters and the ways they are developed. And Winslow is certainly talented at creating unique and believable voices for her characters. I initially misread Mathilde’s name as Matthew and was slightly confused as I read her first section, because I thought I had seen a masculine name, but I was certain that this character must be female, just by the way Winslow wrote her. Similarly, I was able to discern between Frohmann and Keene’s sections almost immediately even without reading their names, because they both have such distinctive voices that they are impossible to confuse. At its heart, The Start of Everything is comprised of a series of misunderstandings – many things must go wrong to create the situations Winslow’s characters find themselves in – but Winslow weaves them together such as that they seem much more plausible than perhaps they should. This results in a mystery with just enough twists to keep the reader on her toes, but not so many that it all seems unlikely, aka the perfect mystery. Whether you’re a fan of mysteries, literary fiction, or both you’ll find something to love in The Start of Everything. Very highly recommended. I read this one as well and couldn’t agree more! I don’t read the genre very often, although I’m not sure why since I always enjoy it when I do, but I will make note of this book- it sounds good! This sounds like a great read! I’ve added it to my list. I don’t read enough mysteries. This one sounds good, especially with such well-developed characters. Sounds really interesting! I’m finding I do enjoy mysteries, but the more literary ones are definitely more my cup of tea.